Eyes are one of the most sensitive and important parts of our body. Not just it acts as an essential aspect in one’s beauty, but it enables us to see this beautiful and magical world. No one can deny that the eyes are probably the most important part of our body and it deserves good care and attention. I am sure you would agree to the fact that having poor eyesight can cause immense problem in our day to day life. Ability to see something is way more important that the ability to walk, hear or speak. Hence we all should take good care of our eyes, and if you are wondering about to take care of your eyes naturally and easily, then here’s the post worth checking. Today in this post, I am sharing the list of 16 of the best eye care tips that’ll help you to take good care of your eyes naturally. Most of us work in front of desktop and laptops for long which as per research, is one of the major reasons behind the increasing vision related problems in recent times. But, to survive in this competitive time, you have to give your best shot no matter what. and so it is hard to avoid computers. Obviously you can’t do without computers, laptop, mobile and other such gadgets for these have become a part of our day to day living. When such is the situation, you can’t afford to not take care of your eyes. If you suffer from the poor vision from a very young age, then doctors are going to advise optics and power lenses, which means, you will end up hiding those beautiful eyes behind your glasses. Contact lenses help but many doctors do not recommend it until you reach a certain age. Wearing contact lenses is not so easy and hence it’s recommended to adults only. But thankfully there are natural ways to take care of your eyes and that will help you minimize the bad effects of working for long hrs on computers and laptops, and also strengthen your eyes health. Once you learn about how to take care of your eyes, you can apply those best practices and do the damage control to a good extent. I have a family hereditary where most of my dear one’s has suffered from poor eye health from a very young age. Naturally there was every possibility that I would have been also one of them. But, thanks to my destiny and to my hard work that I am still blessed to have good eyesight. I take good care of my eyes and my strong vision is my greatest reward of my eye care efforts. So, are you ready to learn the best eye care tips that’ll help you to take care of your eyes easily? So let’s explore those eye care tips to take good care of your eyes. These tips and hacks will enable you to have a strong vision for a long time. Poor eyesight can be caused by various factors including genetics, age, excess stress on your eyes, lack of proper nutritious food or due to an accident. So, no matter what caused your poor eyesight, the basic care for the eyes is same for everyone. You need to try out ways to avoid them getting overstressed and give them adequate rest so that your eyes get time to recharge. 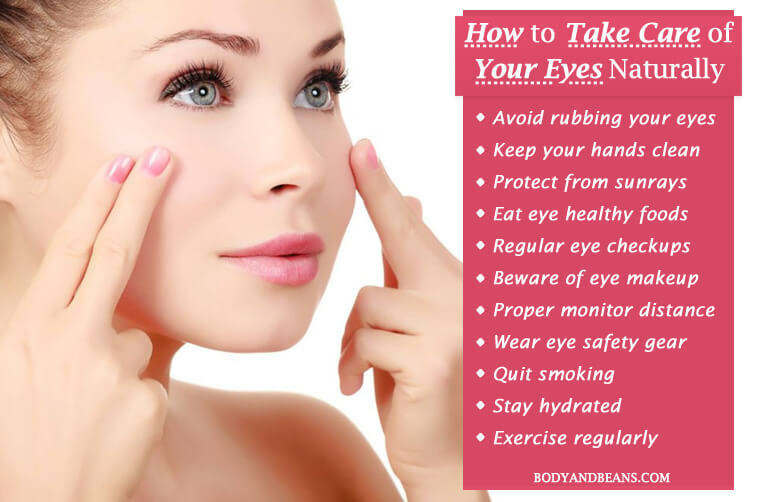 Listed below are the top 16 eye care tips that’ll help you to take care of your eyes naturally. Take careful note of each of these eye care tips and try them out to improve your eyesight and get rid of other common eye related problems. Many of us have this habit of constantly rubbing the eyes and if you are one of them, then you have to get rid of this habit. Your hands are exposed to so much of dust, dirt, germs etc. and when constantly rub your eyes with your hands; it may lead to irritation and other types of eye infections which is not good for the overall health of your eyes. If you are serious about taking care of your eyes, then make it a habit to not touch or rub your eyes with dirty hand. Get rid of this habit to avoid different types of eye related issues and infection. Besides controlling yourself from rubbing your eyes frequently, you must also try to take up the habit of keeping your hands clean all the time. The reason is that, even if you rub your eyes by mistake, your hands will be at least clean and free of germs which will prevent the occurrence of the infections and the irritations in your eyes. Every time you change your glasses or use contact lens, be very sure that you wash your hands properly with hand wash. And, whenever you go out, it is better to keep a good hand sanitizer in your bag. This will enable you to disinfect your hands whenever you want to. Your eyes are very sensitive and too much exposure to the ultraviolet rays of the sun may cause severe damage to your eyes. Various studies including this one by NCBI is a proof of the fact that that excess exposure of eyes to ultraviolet sun rays can cause damage to your eyes. It may leads to age related macular degeneration, photokeratitis or cornea sunburn. So, whenever you step out of your home in the sun, make sure you are wearing UV protected glasses or contact lenses. This will make a good style statement as well as will protect your eyes from the harmful sunrays. You can also carry an umbrella or wear hat, caps etc. to cover up your eyes from the harsh sun rays and this is the basic eye care routine that will help you take care of your eyes naturally. Well, there are many health hazards associated with smoking, one of them being poor eyesight. If research is to believed, cigarette smoking is closely associated with severe ocular diseases. You will be at more risk of getting affected by age related macular degeneration and other problems like cataract of you smoke heavily. If you are a serious smoker and you are not going to quit smoking then it may lead to partial or permanent blindness as well. It will slowly damage the optic nerves and cause impaired vision overtime. So if you are serious about taking care of your eyes then please quit smoking habits and protect your eyes from its harmful side effects. In fact, not just for eyes, you should quit smoking for your general health and wellbeing as well. As I always say that whatever you eat exerts a direct impact on you. So if you have to bring a positive outcome and make your eyesight stronger, then you gotta eat healthy and eyesight friendly foods. As per scientific research, nutritious foods like those rich in lutein, omega 3 fatty acids, zinc, beta-carotene, Vitamin C, Vitamin E etc. are good for your eyes. Include more of these in your day to day diet to improve your vision and prevent various eye related disease and disorders. Family eye health history plays an important role in causing several eye related problems from a very young age and science has already proved it in various ways. Although we do not have much in our hands as far as genetics is concerned. But having proper information regarding your family’s eye health history will help you in taking care of your eyes much efficiently. You better talk to your parents and other elders about it and take a note of the kind of eye problems they faced. According to that, you may consult doctors and take measures to prevent the occurrence of the eye related issues. It is not just important for people with bad family eye health history but for people in general as well. If you really want to avoid any eye problems, then you must visit your eye doctor 3-4 times yearly and do the checkups. Go for the various examinations and see whether every part of your eye is properly working or not. This actually will help in identification of early indications of eye problems, some of which may not get easily treated once they reach advance stages. Moreover, doing eye test timely will also help you identify problems like high blood pressure and diabetes that also needs proper treatment and is better if caught in the early stages. The eye makeup you are using is also a matter of concern, thanks to the harmful chemicals that most of the market products contain. The best thing to do is to remain natural and avoid too much usage of the eyeliners, mascaras, eye shadows etc. but if you still want to use them, then avoid using them daily and wear only on important occasions and that too products that are branded. Also, do not forget to remove the eye makeup properly before going to the bed as keeping them nightlong may lead to bacterial build up and lead to several infections and allergies. Besides that, remember that whenever you are using brushes to apply your eye makeup, make sure that those brushes are properly cleaned. In fact, I will also suggest you not to wear the eye makeup of others as sometimes the eye infections or other eye problems are quite contagious. Hence it is better to avoid direct contact with the eye products used by the infected individual. By now, you already know how working on computers and laptops at a stretch can lead to a number of eye problems, hence maintaining proper monitor distance is probably the best way to take care of your eyes. All you need to do is to keep the monitor at an arm’s length away from your eyes and it mustalso be kept at 20 degrees below your eye level. This is the proper posture as it puts minimal strain on your eyes. However, besides this, you must be very particular about the room lighting. Make sure you have sufficient diffused light in the room when working on computers and laptops. Avoid too much focused and bright lights as that can stress your eyes too much. Another advice that I would like to give you is that, please avoid working at a stretch for long hours. Take small breaks in between, splash some cold water on your eyes and then resume your work. While working on a computer, make sure you look away from the computer screen every twenty minutes and fix your gaze at any particular object that is around a distance of 20 feet away from the place you are sitting. Blink your eyes successively 20 minutes to prevent your eyes from getting dried. Also, in every 20 minutes, get out of your chair and move around 20 steps. This will give you a mini break and will also give some rest to your eyes. It is also necessary for proper posture and also enables proper circulation of the blood throughout your body. Getting proper sound sleep of 7-8 hours can be magical for your overall health, including eyes. 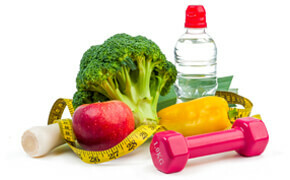 Our body is like a machine that works all through the day but it can work till the time it has the energy. A proper sound sleep is necessary to recharge yourself and enable your body to work with full vigor. Your eyes have worked hard in the day and during night, you have to sleep properly so that your eyes get enough rest else it may lead to eye pain, headache or fatigue. Once you get up after getting the good sound sleep, you automatically feel that your eyes are revitalized and healthy. Till now, you must have heard that exercises are great in reducing excess body fat and enables overall good health but did you know that some of them are especially beneficial for your eyes? Well, if you look into modern research, you will know that some of them like moderate walking or vigorous running was actually found to reduce the risk of cataract. So, what are you waiting for? Make this your daily duty to go for a run or a mild walk every morning and maintain the physical fitness especially of your eyes. No matter what activities you are getting involved in, it is necessary that you take proper care for your eyes and eye safety gear can help you with that. Like for example, when you go to the swimming pool to swim, you know that it contains chlorine which can get into your eyes and cause irritation. So, do not forget to take your goggles along with you the next time you go swimming. Similarly, when you are gardening or cleaning your home, do wear the safety glasses so that your eyes are protected from the dust, dirt, germs and from any kind of injuries. Water is essential for the proper functioning of your body and as per studies drinking water in good amounts forms one of the best ways to take care of your eyes. Dehydration can cause several health problems including making your eyes very dry and irritated. So, to avoid that, you must drink enough water and keep your eyes protected. Moreover, drinking water will also help you get rid of the eye bags and make your eyes look more attractive. See, in many cases people who are born with good eyesight starts facing several eye related problems when they have this habit of reading books or using mobile phones while lying in bed. Let me tell you, that is not the correct posture of reading. You must always be sitting erect while reading. Lying down and reading causes unnecessary stress on your eyes which leads to increase in the power and several other eye problems. In fact, when there is too much stress, you will automatically experience swelling of your eyes and headache. So, please avoid using mobile phones or reading while lying on bed. One of the easiest ways to take care of your eyes is to maintain a clean and hygienic environment at your home and workplace. The amount of pollution has increased on an alarming rate which affects our eyes, because eyes are too sensitive. Any dust particle or dirt or germs may enter your eyes and cause severe irritation and harm. Now, it is practically not possible to go and clean the whole world but if people actually take the initiative in keeping their own space and nearby surrounding clean, then the world will become a cleaner place to live in. Not just cleaning the surrounding space is important but the things you are using must also be clean. Hence, change the towels and linens on a frequent basis so that dust does not get much accumulated there creating eye trouble. Having a good vision is a part of healthy life and one must take proper care of his/her eyes so that they perform at its best. While some are genetically blessed with good eyesight, others have to wear specks from a very young age. But, even though you have good eyesight that does not mean that you will never have eye problems. So it is important for each one of us to take good care of our eyes. Not eating healthy and nutritious diets may cause different types of health troubles, including problems related to eyes and vision. I have already shared the most common eye care tips to protect your eyes naturally and I hope you are going to apply these hacks to take care of your eyes naturally. Each of these hacks helps in relaxing your eyes muscles and improving the strength of your eyes. If you follow these consistently, then you will yourself feel the difference within a short span. However, apart from performing applying these eye care hacks, consulting doctors from time to time will help you take good care of your eyes. You should not ignore your eyes and go for timely checkups and eye examinations as that will help you identify any early indication of any disease. So, are you having problems with your eyes and desperately wants to improve your vision? Well, then besides consulting a good doctor, please do apply some of these eye care tips and do take good care of your eyes. Most of these eye care tips are proven to be highly beneficial in taking care of eyes and so it is upon you to implement the things properly and reap the maximum benefits. How do you ensure your good eye health? How do you take care of your eyes? Do you know any other eye care tips that can help in taking care of eyes? Feel free to share it by commenting below. Until then, stay happy, stay healthy and experience the beauty of this wonderful world with your eyes.